Gardeners can enjoy gardening at many levels. We can experience the Zen of Weeding, as I did this afternoon, and then shift to enjoy one of gardening’s many other dimensions. Gardening often turns up in the wonderful world of public policy, a dimension that can resemble a house of mirrors. The Case of Colony Collapse Disorder, an example of gardening in public policy, is in the current news with a flurry of contradictions. Colony Collapse Disorder refers to the widespread, sudden mysterious deaths of entire bee colonies. We deplore the premature demise of these colonies, and sympathize with the industrious victims, and fear the potential threat to our own wellbeing: bees pollinate about one-third of all the fruits and vegetables we eat. Scientists studying the causes of CCD suspect a combination of factors, and environmentalists focus on neonicontinoids, a category of very effective and widely used systemic pesticides. 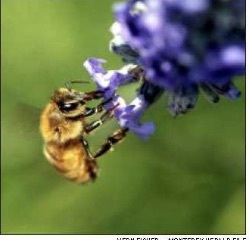 Both commercial crops and garden center plants and seeds are often treated with “neonics” (as they are called). Several European nations have banned neonics, but the United States currently permits their uses. Manufacturers of neonics have insisted that CCD results from several other factors, e.g., Varroa mites, Nosema fungus, viruses, drought, and loss of habitat. Others have speculated that bee colonies are traumatized by the practice of trucking hundreds of beehives to large-scale agricultural sites, such as California’s almond trees groves. In May of 2014, Harvard University reported an environmental scientist’s research that “strengthens the link between neonics and CCDs. The head of the National Academy of Sciences’ earlier study of the problem dismissed that research, and called it “effectively worthless,” because it was based on bees’ exposure to pesticides at doses far above typical levels. On June 20, 2014, President Obama issued a Presidential Memorandum calling for the creation of a federal strategy to promote the health of honeybees and other pollinators. This call to action included an order for the Environmental Protection Agency to assess the effect of pesticides, including neonicotinoids, on pollinator health. The Task Force, including multiple federal departments, was to develop a National Pollinator Health Strategy within 180 days, so its report was due around Christmas time last year. Presumably, it has been subjected to internal review since that target date. On March 20, 2015, the U.S. Department of Agriculture reported that honey production in 2014 was up 19 percent from 2013, leading some to conclude that the CCD problem was over. Beekeepers had imported Australian honeybees to replace hives lost to CCD, so that conclusion might require another look. These events provide a glimpse of the process of creating public policies, which are influenced by environmental, economic and political forces, and which eventually impact our interests as individuals. No one has suggested that neonics are good for the honeybees. The goal is to balance the undeniably negative effects of agricultural chemicals with the anticipated positive long-term effects on our food supplies, recreational gardening and quality of life. Gardeners can help the bees in small ways. Do not use garden chemicals containing neonics. When buying plants or seeds, ask the retailer if those items are free of neonics. Organic gardening methods would be best for gardeners…and bees! The Genetic Literacy Project supports GMOs, dismisses neonics’ role in bee deaths, and doesn’t like organic foods. The project seems friendly to the chemical industry. An increase in honey production is welcome, but it doesn’t mean that bees and other pollinators are safe from pesticides. This task force was to report in 180 days. That would have been around Christmas, 2014. Let’s watch for the report. This paper is a couple years old, but still relevant. This entry was posted in Essays 2015, Spring Quarter and tagged Bees, organic, Pests by tomkarwin. Bookmark the permalink.